Please make sure you click the correct link. If you sign up for the wrong match up, we have to do it over again. 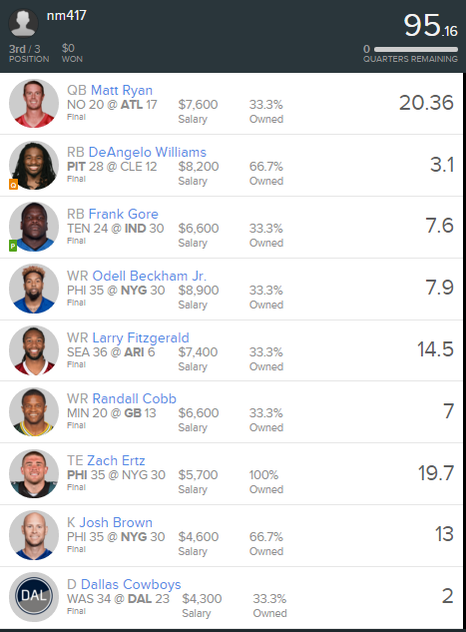 I posted the lineups a day early this week since the games start a day earlier. 1. Gabe vs 2. Dusty click here. 3. Taylor vs 4. Ray Cruz click here. 5. Joe vs 7. Ray Clark click here. 6. Samir vs 8. Nick click here. Gotta give it to myself this week. Most of you saw my score as 143.76, when it was actually 117.76. I did that last minute tinkering again and replaced Houstons Defense with the Rams. Now ultimately it didn't make much of a difference, I still won. However, I won by less than a point. Had I run with my initial setup I wouldn't have been sweating nearly as much. 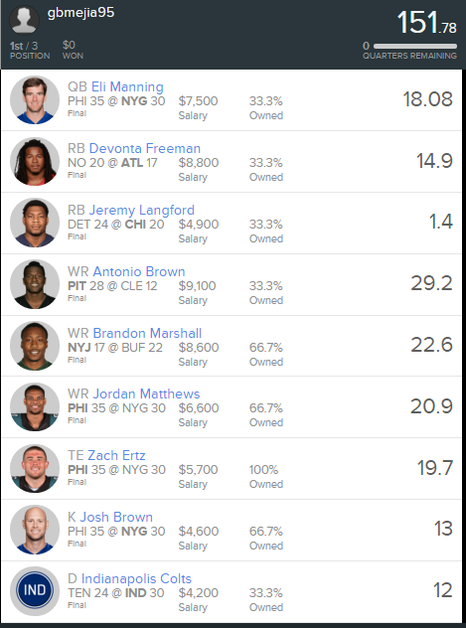 What I ended up doing was picking a defense that was $200 cheaper so I could afford a kicker that was $200 more. Go figure the cheaper kicker scored more, and the more expensive defense scored WAY more. Ray finishes second place because, with he and Samir having a tied win/loss percentage among the tied players, it goes to points. Ray beats Samir in points. At least I'm winning in the 'League of Legends', right Dusty!? The first two weeks I've been pitted against the guy with the best score of the week. What's with that? Really wish i did my lineup before i started drinking my brandy. 1-2, but #1 in total points. There's my facepalm. Remember: if the tie is more than 2-way, it goes straight to points. Nick also provided the bottom-feeding Clarks with half of their victories. Last week he was less than 10 points behind me with two players left. I figured I was toast...then he got ONE point from those two players. Thanks for saving me from a second consecutive week at the bottom of the pool, Nick! Ray Bowl II!! Bring it on, Cruz! I sputtered there at the end, but admit it, Ray, I made you sweat right up to the point where Floyd went down! It's the battle for first place this week Samir ! Each week you will face off against one of the other players in the league. The player with the most points in each matchup will earn a victory for the week, while the loser gets a loss. Who you play any given week will be based on a round robin style system ensuring everyone plays each other. After 17 weeks, playoffs will begin. The 4 players with the best records will go on to the playoffs. If there is a tie in records, the tie breaker will be based on win/loss percentage of the matches between the tied players. If the players are still tied the tie will be broken by counting the total number of points scored throughout the entire season. The player that accumulates the most points will break the tie and move on to the playoffs. Wildcard Week will be the semi finals with 1st and 4th place playing, and 2nd and 3rd playing. Divisional Playoff Week will be the super bowl where the two winning players of the semi finals compete for the 1st prize. With 8 players first place will take home $600, while 2nd takes home $200.